Last Friday, FIFA published the statistical kits for the Olympic draw (men and women). You will notice the dramatic demographic explosion taking place in Canada. Their population suddenly increased from 34,3 millions to 314 millions (see page 11). Of course, someone at FIFA just made a mistake when sorting the table. 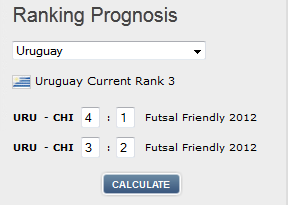 On Wednesday, futsal matches appeared in the list of football fixtures and in the FIFA ranking prediction tool. This is fixed now, but here's a little screen shot.